Tourism Richmond is launching its largest initiative since the Vancouver 2010 Olympic Winter Games by announcing a global audition for a once-in-a-lifetime employment opportunity that will appeal to a food-loving hyper-communicator and adventurer at heart. Boasting over 400 Asian eateries within a population of 200,000 and renowned for having some of the best Chinese cuisine in the world, Richmond is a hidden gastronomic gem that’s a must-add to any West Coast visit. Hoping to capitalize on the international rise in culinary tourism, Tourism Richmond is employing a blogging epicurean who can vividly convey the city’s many restaurant offerings online through the written word, photography and video. “Richmond’s Foodie Blogger” is a one-year contract role with a salary of $50,000, apartment and living compensation (negotiable upon final selection) and a daily stipend for all restaurant meals. And to help burn off all those daily restaurant samplings, the job even includes a one-year membership to the Richmond Olympic Oval (home to a 23,000 square foot fitness centre). Open to anyone around the world eligible to work in Canada for 12 months, applications for this unique role are open March 1 to 31, 2012. In order to resonate as a transparent and authentic experience for both the blogger and his/her followers, content will be determined by the selected candidate with minimal input from Tourism Richmond. Richmond’s Foodie Blogger will, nevertheless, be provided with all the resources and tools necessary to effectively navigate the city. But this position won’t be a walk in the park — the selected applicant is required to visit at least one of Richmond’s 800+ restaurants per day, post online content daily, manage community engagement across various social media channels and must demonstrate a willingness to explore all that Richmond has to offer outside of its food scene. Interested bloggers can apply online via Tourism Richmond’s Facebook page: www.facebook.com/RichmondBC. This is a genuine candidate search and a standard interview process will apply. Tourism Richmond will review all applications and whittle the list of prospective bloggers down to 10 finalists. All finalists will then partake in two rounds of interviews before Richmond’s Foodie Blogger is selected. Applicants outside of BC will likely be interviewed via Skype. 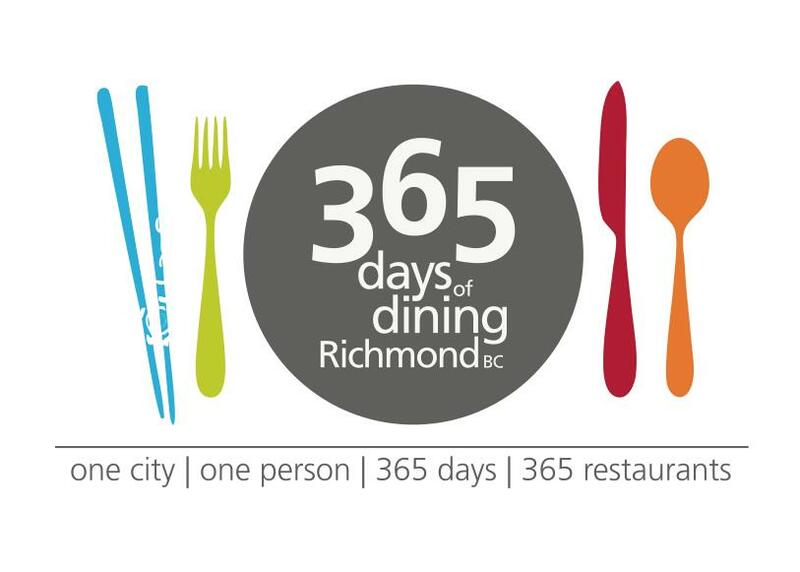 For all Twitter chatter related to the 365 Days of Dining campaign, refer to hashtag #Richmond365. Home to the Vancouver International Airport (YVR), only a 25 minute ride from downtown Vancouver on the Canada Line rapid transit system and close to the U.S. border, Richmond has long been the preferred go-to destination for Asian cuisine. With a population that’s 65 per cent Asian and with the largest proportion of Canadian residents of Chinese ancestry (45 per cent), Richmond boasts more than 400 Asian-influenced eateries and its diverse dishes span the continent of Asia. Alexandra Road – the city’s ‘Wai Sek Kai’ or ‘Food Street’ – where 200-plus Asian eateries are nestled within a three-block radius. Declared by everyone from the New York Times to Conde Nast Traveler as having “the best Chinese food outside of China,” freshly-prepared dim sum, sizzling hot pot, frothy bubble tea, flaky pastries and steaming bowls of congee also await at every corner. Then there’s our world-famous Asian-influenced Summer Night Market: Recently declared by Travel and Leisure Magazine as one of the best night markets in the world, this lively outdoor extravaganza opens May to September and features vendor stalls laden with quirky trinkets (haggling permitted! ), live entertainment and most importantly, dozens upon dozens of food carts to choose from. Nightly crowds of over 20,000 flock here to enjoy signature Asian street foods like Hong Kong-style bubble waffles, stinky tofu, beef skewers, BBQ squid and dragon’s beard candy (a Chinese version of cotton candy). But Richmond isn’t limited solely to its Asian cuisine — the scenic and historic fishing village of Steveston (which today remains Canada’s largest commercial fishing harbour) is renowned for its fresh seafood offerings, artisan coffee shops and tempting bakeries. With all this, plus fine-dining restaurants, funky diners and the homemade offerings of Richmond’s public markets to choose from, there’s more than enough variety to keep a hungry blogger busy for a year.